Existing research on use of social media marketing (SMM) by luxury brands reports that despite the contradiction between the luxury appeals of exclusivity, uniqueness, and status and the accessibility of social media (SM) channels to broad masses around the world, SMM enhances consumer trust and intimacy with luxury brands (Kim and Ko 2010), brand and relationship equity (Kim and Ko 2012), as well as consumer-brand engagement and brand evangelism (Dhaoui 2014). Given the increasing interest in and use of SMM by luxury brands, with the correspondingly growing marketing allocations to SM, it is important to understand how and why luxury consumers interact with their favorite brands, and what potential these interactions may have for luxury brand meaning co-creation. 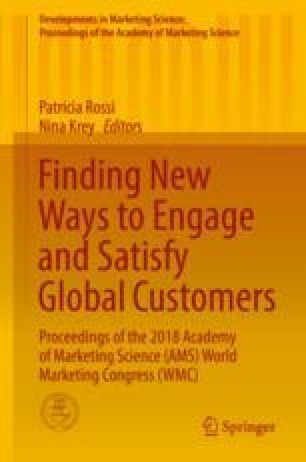 In the past decade, marketing scholars have noticeably moved away from conceptualizing brands as “controllable knowledge structures” and consumers as “passive absorbers of brand knowledge” (Gensler et al. 2013, p. 243). Still, research is lacking in the areas investigating specific behaviors that represent consumers’ input into the process of brand meaning co-creation in SM and the drivers of consumer participation in this process (Alexander and Jaakkola 2016). To address these issues, we investigated discrete behaviors that reflect luxury consumers’ SM engagement in conjunction with their underlying motivations by conducting a content analysis of 30 semi-structured interviews with shoppers inside Paris designer stores. Our findings indicate that consumer engagement behaviors have different potentials for luxury brand meaning contribution depending on the following aspects: (1) intended audience (other brand users, personal social network, and/or the brand), (2) intensity of the effort (from “likes,” shares, and hashtags to active content creation), (3) content creation medium utilized (textual, visual, or hybrid), (4) dominant motivational drivers (singular or combined, intrinsic or extrinsic), and (5) degree of creative input (from merely mentioning or reproducing the luxury purchase to modifying or reinterpreting its consumption). Results indicate that luxury marketers should monitor brand mentions and hashtags in all SM and should not ignore consumers who engage with other SM users as their main audience, since these interactions can help or hurt the brand due to their virality and potential for introducing undesired associations. By monitoring SM for brand mentions and hashtags, brands have an opportunity to timely intercept these discourses. By creating premium and aesthetically inspiring digital content, luxury brands will encourage more mindful appreciation on the part of their customers, reducing the triviality of consumer-generated content and avoiding negative and brand irrelevant associations.